West of Eden is up with the best of the Similan Island dive sites as it is home to both huge granite boulders and beautiful corals. It is a wonderful illustration of how monsoons and large underwater currents, arriving from far away in the West, can shape a marine environment. You can learn more about the difference between East and West dive sites in the feature at the bottom of the page. West of Eden is located to the West of Similan Island seven, with nothing but open ocean until the Andaman islands. The focus of the dive site is a large channel full of sea fans. Look for mantis shrimp, ribbon eels and Frogfish. The massive granite boulders are a signature of all dive sites on the West of the Similans. These impressive formations are a stark contrast to the sloping coral reefs on the East. But why do the dive sites on the East and West have such different characteristics? Typical of all dive sites on the West of the Similan islands, West of Eden is predominantly a boulder dive site. Large channels, interesting formations and a couple of shallow swimthroughs. There is a mooring line in the bay to the south of the main dive site. You can dive in the shallows but there is much more to see down deeper. Between 20m-30m are the healthiest corals and bigger variety of fish species. The bay to the south is a good place to start for inexperienced divers. It is much shallower and usually very calm. Even a current will just give you a gentle drift dive. When you are comfortable you can head out to the bigger boulders in the North. Here you just need to be careful of your maximum depth. 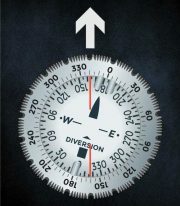 Open Water divers or Scuba Divers will need to watch their depth gauge as some of the rocks can have steep drop offs. If possible, it is preferable to dive West of Eden on Nitrox. There are several beautiful areas deeper than 25m that ideally require a bit of time to explore. After you exit the channel, swim North about 100m, then to the edge of the boulders down at 30m. 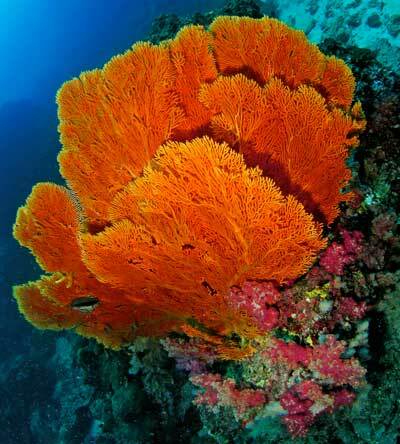 You will see colourful sea fans and a few barrel sponges. The sand in this area seems to be a popular hiding place for frogfish, ribbon eels and peacock Mantis shrimp. The large channel is a great place to start the dive. You can find different kinds of shrimp including the resident spearing mantis shrimp. Gorgonian sea fans protrude from the wall. Schools of flasher wrasse live just on the outside of the channel and giant Moray eels are often hiding under a coral head nearby. The area around the channel is often the most memorable part of the dive and on top of the boulders are some vibrant coral gardens. Large granite boulders forming deep channels and strange formations are evidence of weathering from harsh conditions in low season. This charismatic dive site will undoubtedly leave a lasting impression. West of Eden is usually quite calm but occasional wind or waves from the West can leave it quite exposed. Currents can get quite strong to the North of the dive site and this can create an exhilarating drift dive. Although sea fans and large boulders are great for wide angle photography, there is more macro life here than most other dive sites in the Similan islands put together. This is Thailand diving at its most diverse. If there is a current you may have less time to explore the interesting areas, but you will have so much fun that it doesn’t matter. The shape of the island, and the swirling currents it creates, means current moving North feels stronger than when it is moving South. Jump at the buoy line in the South when there is a strong current heading North. Fly over massive granite rock formations and watch the colours of the coral pass by. Frantic Tuna and Trevally give you something exciting to see in any direction you happen to look. This is also when you are most likely to see Manta Rays. To make the dive a little more relaxed you can jump at the mooring line in the bay to the south of the dive site. Spend 10 minutes heading north along the shallow coral reef. You can find many shrimp, moray eels and nudibranchs hiding in the coral. The sloping reef gradually gets steeper and you will start to see the boulders. Stay at around 14m until you reach the large channel. You cannot miss it. At the top of the channel you can find the resident spearing mantis shrimp. It usually stays inside a hole at around 17m and shares its home with much smaller and brightly coloured squat shrimp. Carry on deeper to the end of the channel. Just outside the channel you can find schools of flasher wrasse. If you stay a few meters back from them and wait, you can watch as they ‘flash’. From the safety of a rock or piece of coral, they make a quick dash whilst extending their exquisite fins, before returning to the original spot. This mating behaviour is great to watch but you will need patience and skill if you want a good photo. Turning right at the end of the channel you will see several large colourful sea fans. Look closely inside to see the small damselfish hiding in the safety of the fan. if you keep following the rocks around they will lead you back up into the shallows. If you still have enough no decompression time then don’t shallow up. Cross over the sandy patch and keep heading deeper. Down deeper the coral gets even bigger and there is much more to find. Down at 30m you can often find frogfish or ribbon eels. Keep heading north past the barrel sponges and eventually shallow up. At the north end of West of Eden is an area with a large overhang and a large air pocket. just next to this is a good place to look for the Giant frogfish. You can finish the dive in the shallows to the North. There are a few caves and swim throughs between 5m-10m. Just be careful as sometimes there can be more surge in the shallows. If there is too much current or surge then stay on the outside of the rocks until it is time for the safety stop. Use this route in mild currents or when it is travelling North. Jump at the buoy line in the bay to the South. Head North until you reach the entrance to the large channel at 16m. Go West through the channel, turn North at the end, then stay deep following the edge of the rocks at 30m. Explore the deeper coral gardens then shallow up. From the bouy line in the South, follow this heading to get to the first large channel. West of Eden dive site runs almost exactly from the South to the North. Finish the dive to the North. Swim out West into the blue for the safety stop. The monsoon rains are a very important factor to consider when booking your Similan diving trip. The main reason is because the Similan island national park closes every year between the middle of May and the middle of October because of the weather. One fascinating feature of the monsoon weather is the way it shapes the dive sites and marine environment. The reason we have a low season in Khao Lak is because of a change in wind direction. Half of the year the wind travels from West to East, across the entire width of the Indian Ocean, before finally hitting the Similan islands. With the wind comes a lot of rain and much larger waves. Underwater there are large amplitude internal waves (LAIW) coming from the Indian ocean that create cold thermoclines that regularly hit the western dive sites. Read the Similan diving page to understand the benefits of these thermoclines. This means for half of each year the West side of the Similan islands is exposed to much harsher conditions. Meanwhile, the East side remains relatively protected. The Similan islands have been around for millions of years and throughout the years, the weather has shaped the Similan islands into two distinct types of marine environment which makes them a very diverse place to dive. On the West are much steeper drops and huge granite boulders. These contain large swim throughs, caverns, channels and generally much more dramatic topography. The East side of the Similan islands is made up of gentle sloping reefs with white sand and coral structures sporadically dotted around. Some dive sites combine elements of both so you can always find somewhere interesting to dive in the Similan islands. So by now you’ve probably guessed that West of Eden is one of the best boulder dive sites in the Similan islands. Huge towering rocks and deep channels make the dive site an enchanting place. If you are thinking of booking a Similan liveaboard then you should make sure that they cover a good variety of dive sites, both East and West, so you can get the full Similan island experience. If you have any questions about particular schedules of different boats then please contact us. Some liveaboards will pass through the nine Similan islands in little more than one day. Others can spend two or three days here and cover many more dive sites. Contact us, and tell us your needs, so we can help find the best Similan liveaboard option for you.